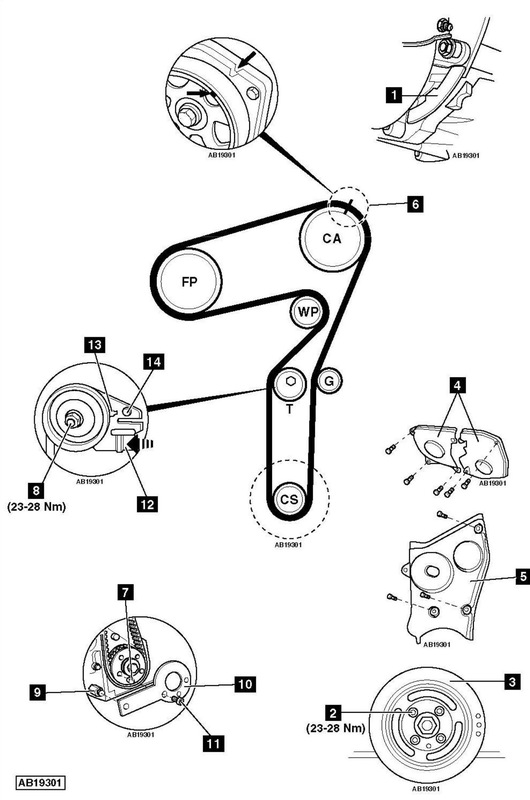 Fiat Doblo Cargo 1.9 2008 cambelt change instructions and replacement inteval. Full guide! Crankshaft timing tool bolt – No.1.860.905.010. Crankshaft timing tool – No.1.860.905.000. Flywheel locking tool – No.1.860.898.000. NOTE: The high-pressure fuel pump does not require timing. Fit flywheel locking tool  . Tool No.1.860.898.000. Drain cooling system and PAS reservoir. RH engine mounting and bracket. Auxiliary drive belt guide pulley. Timing belt upper covers  . Ensure camshaft sprocket timing marks aligned  . Ensure pin on crankshaft sprocket at 6 o’clock position  . Slacken tensioner sprocket nut  . Move tensioner sprocket away from belt. Lightly tighten nut. Ensure camshaft sprocket timing marks aligned . Ensure pin on crankshaft sprocket at 6 o’clock position . Remove oil pump bolt. Insert stud of crankshaft timing tool . Tool No.1.860.905.000. Fit timing tool to crankshaft sprocket . Tool No.1.860.905.000. Secure with bolt . Tool No.1.860.905.010. Fit timing belt to remaining sprockets and pulleys. Lever tensioner sprocket bracket at position  until pointer  and mark  aligned. Tighten tensioner sprocket nut . Tightening torque: 23-28 Nm. Fit timing tool to crankshaft sprocket . Secure with bolt . Ensure tensioner sprocket pointer and mark aligned  & . Fit flywheel locking tool . Tool No.1.860.898.000. Tighten crankshaft pulley bolts . Tightening torque: 23-28 Nm. Remove flywheel locking tool . Tool No.1.860.898.000. Tighten auxiliary drive belt guide pulley bolt. Tightening torque: 23-28 Nm.